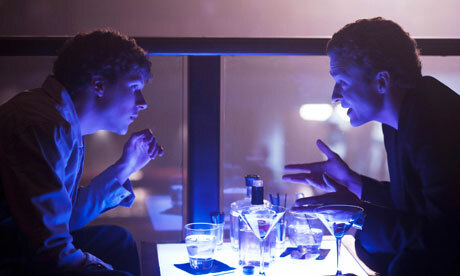 The Facebook biopic Social Network opened this past weekend, topping the box office. Crowds for the film’s opening at the Mall of America on Friday were surprisingly low, but then again not surprisingly. As a destination the Mall is best suited to the opening of big, loud, explosive blockbusters. West Wing nerds, anticipating the second of Aaron Sorkin’s Hollywood features since his TV series ended in 2006, might find smaller, neighborhood art-house theaters better suited to stories like Sorkin’s, the most intense action of which happens during snappy conversations played out in offices, bedrooms, and conference rooms. Still, it was odd to walk out of the film buzzing with ideas, and with the trailing emotional experience David Fincher’s directing gave of the tingling alchemy that happens when everyday moments become history, and then to look out over the cavernous interior of the Mall. Because below, for the moment oblivious as they walked the wide marble hallways, visited the stores, ate together in the food courts, and rode amusement park rides, were the real subjects of the movie: many of us. A 2009 Harris Interactive poll said just under half of Americans actively use Facebook or MySpace accounts. That was a year ago. Surely the Facebook numbers, which during certain stretches have risen by 60,000 new users a day, are far higher now. Then again The Social Network is not really about us at all. It’s about Facebook founder Mark Zuckerberg. (Zuckerberg is played by Jesse Eisenberg, who skillfully transformed the well-practiced harmlessness of his other roles into a kind of sociopathic naivete). People, the Facebook users whose murmuring conversations, lone exhortations, solitary musings, and narcissistic pronouncements allow there to be a Facebook story at all, are for the most part never seen in the film as anything more than numbers ticking on a wall-sized display in the film’s fictional Facebook headquarters. There are exceptions, a couple snapshots of initial adopters in separate, private, individual-college-based networks of what was then called The Facebook, where people “Facebooked” versus Friended each other. In these montaged vignettes of kids in dorm rooms Sorkin and Fincher put a human face on growing millions of people they thereafter only refer to second-hand, as users. From then on the suggestion or mention of this user-base creates pressure, portent and possibility that compress Zuckerberg, his friends, his enemies, and his allies into those tight physical and emotional spaces where this kind of drama thrives. "Put money in thy purse Mark! Steal the Facebook." Sorkin explored this aesthetic before. We seldom saw the voters whose potential approval or disapproval kept members of The West Wing‘s fictional administration scrambling for six seasons, and we seldom saw those characters outside the corridors for which the show is named. Indeed, several times throughout the show’s all too short history, world annihilation was averted not by land, sea, air, or space but in offices, in conference rooms, and in brisk walks through narrow hallways, adjoining rooms, and hectic bullpens. A small group of driven, fiercely idealistic, and sometimes self-serving personalities grappling in palace rooms, shuffling thousands of faceless pawns back and forth for leverage against each other: sounds like the kings and their courts in any number of Shakespeare’s tragic history plays. It’s appropriate that Sorkin wrote West Wing‘s President Bartlet as a classicist. According to a far warmer and more sympathetic portrait than Sorkin’s by Jose Antonio Vargas, in the September 20 issue of The New Yorker, Zuckerberg, who studied the Greeks and Romans at Exeter, is a classicist too. Seeing The Social Network in the mall theater was actually a perfect setting. The thousands of would-be Facebook customers below weren’t rushing to see the movie about Facebook because they were too busy hanging out with their family and closest friends. The tremendous hype surrounding social media falsely suggests people invented Facebook, a manipulation Sorkin and Fincher’s film is so effective in showing to be false. Facebook, Twitter, and LinkedIn really aren’t that important to those mall customers, or at least to their relationships, which are what brought them to the mall at night. Few of them were shopping alone. Cut back to the movie’s establishing vignettes of Facebook’s early adopters. It’s very significant to remember the web site was first launched as a series of networks exclusive to specific colleges. A college campus is a self-contained and tightly-knit community. It affords an intimacy the scope of which most young adults will never experience again after graduating. As the movie shows, their use of Facebook was in fact a retreat from those intimate relationships. We see them alone, pasty and hollow-eyed in the glow of a radiating monitor, typing in the dark.